ISIS was “scooped” yesterday by Jeffrey Lewis and Catherine Dill who published in 38North a well-researched article entitled “Smoke and Mirrors: DPRK Front Companies in China and Russia” about a North Korean company called Ryonha Machinery Joint Venture Corporation and a Moscow entity owned in part by North Korea named KORTEC or Koryo Technological Corporation. We congratulate them for an excellent article. This note adds mainly to their reporting on KORTEC. Ryonha is a producer of a wide range of machine tools, including Computer Numerically Controlled (CNC) machine tools. It makes machine tools itself but its sales literature shows that Ryonha CNC machine tools often use Taiwanese controllers, and in at least one case a customer was offered the option of buying a German controller. It is very unlikely that these manufacturers of controllers sold North Korea their products; they were likely deceived by front companies or other methods. Ryonha was sanctioned by the United Nations Security Council in 2013 for supporting the WMD programs of North Korea, often through use of aliases and front companies or subsidiaries of Ryonha established abroad. As the article by Lewis and Dill states, Ryonha continues its international activities in China and it may perhaps continue selling in Russia in violation of sanctions. In Moscow, as Lewis and Dill point out, Ryonha conducted operations under the North Korean state-sponsored company KORTEC that was created as a joint economic venture with Russia in 2011 or 2012. It should be noted that there is some evidence that Ryonha was active in Moscow trade fairs before that date. The purpose of Ryonha’s operation in Russia appears to have been primarily financial, namely to make money for North Korea. However, it may have also sought to acquire Western and Russian dual-use goods, including advanced machine tools, for transport back to North Korea. Since the sanctioning of Ryonha, KORTEC has been prohibited from selling Ryonha machine tools in Russia and elsewhere and Ryonha is also prohibited from profiting from its sales abroad due to UN Security Council sanctions. ISIS would like to add to the Lewis/Dill effort a translation it had prepared of the brochure shown in the article about KORTEC (figure 1). As Lewis and Dill pointed out, and who also found this brochure, KORTEC shows for sale from its base in Moscow many Ryonha products with the name of Ryonha removed. Many of the model numbers, however, remain the same when referenced with past Ryonha product catalogues. Ryonha’s factory floor appears in a photo to be the same as KORTEC’s. A search of KORTEC web sites also showed that some machine tools advertised by KORTEC still had the label Ryonha in Korean on them. Additionally, as Lewis and Dill discovered, a recently removed but archived version of the KORTEC website states that it is a supplier of Ryonha products. Russia reportedly terminated its economic relationship with Ryonha shortly after UN sanctions were placed on the entity in 2013. After that date, KORTEC web advertisements show that it mainly advertised the sale of CNC machine tools from several Spanish and Taiwanese companies. The presence of advertised Ryonha machine tools appears to have diminished after the date of sanctions. 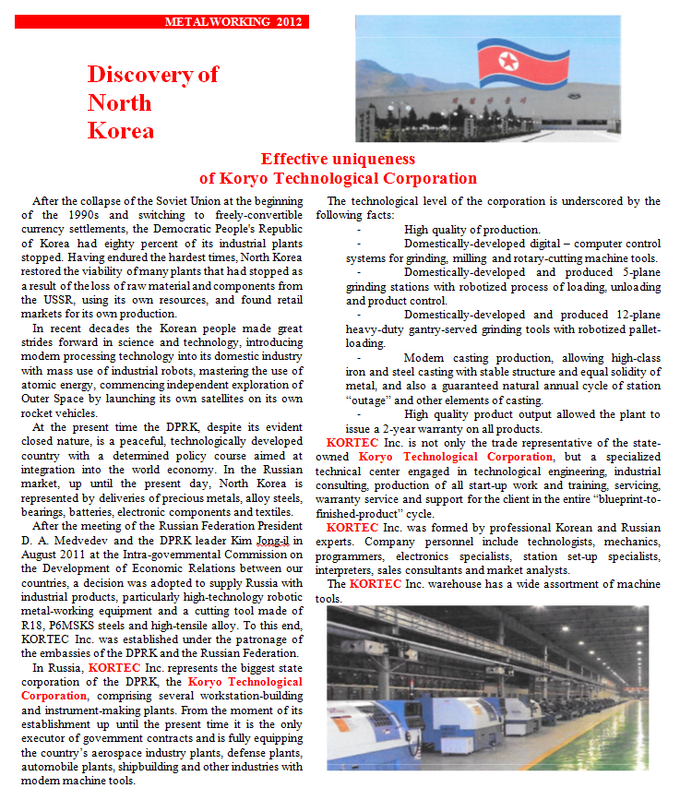 It is possible that KORTEC changed management or ownership after the sanctions were imposed on Ryonha, and the new KORTEC management no longer had any connection to North Korea. But it is also possible that Ryonha continued some form of relationship with KORTEC afterward or is operating in Russia via a different front company. In any case, if Ryonha continues to profit financially through any endeavor, it would be a violation of UN sanctions. ISIS agrees with the conclusion reached by Lewis and Dill, namely that Russia and China should assist the UN Panel of Experts on the DPRK in investigating the issue further. Does KORTEC still exist? Who owns or controls it? Is there any North Korean involvement? After sanctions were imposed in early 2013, was Ryonha in any way still involved in KORTEC’s operations? Has North Korea acquired via KORTEC, or other fronts in Russia, sanctioned, dual-use goods, including CNC machine tools, from Spain and Taiwan for import and use in North Korea’s WMD, military, or other industrial programs? Has Ryonha stopped profiting financially from KORTEC’s sales of machine tools and other dual-use goods in Moscow? Is Ryonha profiting via different fronts in Russia, in violation of sanctions? Figure 1: Professional translation of KORTEC/Koryo brochure discussing the establishment of the company in Russia.